U.S. Army Brigadier Gen. William Bester, Marty Witrak and Julie Anderson. The College is beginning a major initiative to prepare rural veterans for nursing careers. The U.S. Department of Health and Human Services HRSA (Health Resources and Services Administration) awarded nearly $1 million to St. Scholastica to train veterans from rural areas who are interested in the nursing field. The new program will be called INVITE (Implementation of a Nursing Veterans' Initiative to Transform Education). "This grant is an exciting opportunity that puts St. Scholastica in the perfect position to serve our region's 33,000 veterans, while also meeting a health care need in Minnesota's communities," said Dean of Nursing Julie Anderson. "It will enhance our solid reputation as a veteran-friendly school." 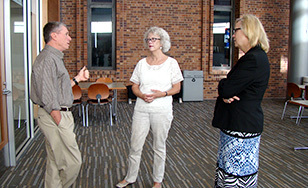 Marty Witrak, who helped apply for the grant near the end of her tenure as Dean of the School of Nursing before retiring earlier this month, explained that the new program is a great fit for St. Scholastica, which participates in the Yellow Ribbon Program for veterans and has a high number of students from rural areas. The Yellow Ribbon Program allows colleges to provide extra funding to support GI Bill® recipients. "A lot of veterans will tell you that nobody understands them like another veteran," Witrak said. "Part of the grant is to hire a full-time faculty member who is him- or herself a veteran, and to work with these students to support what their experience has been." The grant will promote the recruitment, enrollment, retention, graduation and placement of veterans seeking a bachelor of science degree in nursing. Participating students will take part in a variety of clinical experiences and interact with veteran nurses at VA hospitals, clinics, and other facilities. Other academic advantages for participants include access to nursing veteran library resources; an iPad air to utilize electronic materials, and access to the Nursing Veteran mobile app to be developed as part of INVITE. The benefits of INVITE are two-fold, Witrak said. "We know that a lot of vets coming back are having a hard time getting jobs, and we know we need nurses," she said. "So what's not to like about this?" The grant covers over a three-year period. St. Scholastica's nursing students start the program during the spring semester of their sophomore year, so administrators will start seeking participants from the pool of veteran students already in the pipeline with a goal of kicking off INVITE during spring semester 2016. St. Scholastica hopes to serve at least 24 students, but won't turn veterans away if they are qualified applicants. The College is bringing retired U.S. Army Brigadier Gen. William Bester on board as a consultant. A 1974 St. Scholastica graduate, he went on to become chief of the Army Nurse Corps, where he was responsible for policy and programs for 3,415 Army nurses and more than 13,000 reserve component nurses. Bester is an experienced leader in policy making, relationship building and academic nursing. With Witrak's retirement, Anderson takes over as the administrator of the grant. Anderson came to St. Scholastica from the University of North Dakota, where she served as Interim Dean for the College of Nursing, Associate Dean for Graduate Studies, Associate Provost, and Acting Director of the Chester Fritz Library. This project is supported by the Health Resources and Services Administration (HRSA) of the U.S. Department of Health and Human Services (HHS) under grant number UF1HP28513 for Nurse Education, Practice, Quality and Retention - Veterans' Bachelor of Science in Nursing Program in the amount of $885,676 (with at least 10 percent of the project financed with nongovernmental sources). This information or content and conclusions are those of the author and should not be construed as the official position or policy of, nor should any endorsements be inferred by HRSA, HHS or the U.S. Government.